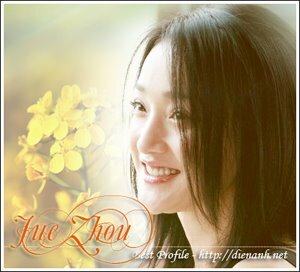 Internationally acclaimed Chinese actress and singer, Zhou Xun, came to international attention through her roles in Suzhou River in 2000, and Balzac and the Little Chinese Seamstress in 2002. But acting and singing are not her only jobs. She's a devoted environmentalist in spare time. And she's currently in Sichuan to work as a volunteer to help the earthquake-affected people there. Our reporter Xiaoyu finds out more. This April, Zhou Xun was appointed as the United Nations Development Program's first Chinese National Goodwill Ambassador to promote Chinese environmental sustainability. When she received a small green potted plant as a gift from the UNDP, Zhou Xun immediately pointed out that they should not use plastic as the cover and took it off. In her daily life, she also pays great attention to details, such as not using one-off chopsticks or plastic bags. Zhou Xun says that environmental protection should not be compulsory, but a voluntary lifestyle. "I think everyone can do his or her part for environmental protection. If you always have this idea in mind, it will become part of your life. For example, in many hotels, lights in bathrooms and hallways are kept on all day long, so I turned off the lights after I used the bathroom. And when I went there later, someone had turned the lights back on. This happened again and again, but I cannot stop myself from turning off the lights so that I can save electricity before someone else turns them on." Based on her personal experience, Zhou Xun has a suggestion for drivers. "In summer, the car is very hot inside after being parked in the sun, so people usually turn on the air-conditioning for a while before they get in. This is a waste of energy and produces a lot of carbon dioxide. But covering the car with a piece of special reflective board can avoid wasting energy." Zhou Xun told CRI that if it is not so hot outside, she will turn off the air-conditioning and keep the car windows open. It is romantic in her eyes. But she then added that if the air outside is badly polluted it is not romantic at all. She then calls on everyone to contribute his or her part to environmental protection, then the world would become cleaner, more beautiful and romantic. Thus a program named "Our Part" has been formed through the joint efforts of Zhou Xun and the UNDP. Launched on the eve of this year's Earth Day last Thursday, the two-year program aims to leverage Zhou Xun's star power by motivating individuals to take part in the fight against climate change. People are encouraged to adopt simple lifestyle habits such as choosing reusable chopsticks in restaurants or switching to more efficient, energy-saving light bulbs. The program's name "Our Part" is meant to tell people that small lifestyle changes can collectively make a big difference. This is an environmental protection tip for "Our Part" recorded by Zhou Xun, which will be broadcast for the next three months on CRI's domestic channel. Aside from this, she has been featured in cover photos for "Time Out" magazine and has provided environmental protection tips as one of the publication's guest editors. Making so much effort for the program, how much she should be paid? Zhou Xun reveals the secret. One US dollar. It is her annual salary as the National Goodwill Ambassador of UNDP. The dollar was only a token payment and she took the voluntary job because she feels an obligation to promote environmental protection. When talking about the nationwide plastic ban, Zhou Xun told CRI that she stopped using plastic bags years ago, and shares the idea of using environmentally-friendly bags with friends. However, she also pointed out that it is not a great idea to produce too many such bags. "Although using environmentally-friendly bags can avoid white pollution, the process of producing and carrying these bags may also cause other forms of pollution. So I think one environmentally-friendly bag per person is enough. We should find a favorite one and keep using it till it's worn out. You can also share spare bags with friends or family and suggest that they join in this campaign." In the meantime, Zhou Xun has been busy arranging a relief plan for the victims of the May 12 earthquake in southwest China as a lifetime volunteer of Jet Li's One Foundation. Last Sunday, she went to Sichuan to see the children there. As it was the Chinese Dragon Boat Festival, she brought the traditional festival food zongzi, the glutinous rice dumpling wrapped in bamboo leaves. She hopes by eating the zongzi made by her mom, the children in the quake-stricken areas can feel the love of all the people who are trying their best to help them.